"What should we hang? The holly or each other?" Henry II to his assembled family. Based on the Broadway play by James Goldman (which starred Richard Preson as Henry II, Rosemary Harris as Eleanor and a young Christopher Walken as Philip). 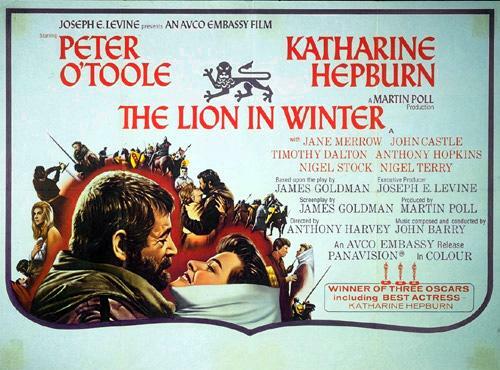 Some people watch A Christmas Carol at the holidays or A Christmas Story but my favorite Christmas film is The Lion in Winter. I could watch this film over and over (and I have) and never get tired of it. From the opening credits, as the music swells, and the chorus starts singing in Latin, the audience is plunged into this 12th century world, where no one can be trusted, brother is pitted against brother, husband and wives sharpen their knives, and a good time is had by all. Taking place in a twenty-four hour period, the film is full of acid wit, the audience needs a scorecard to keep up with whom is backstabbing whom in this film. Set in 1183 it’s just another dysfunctional family Christmas with the Plantagenets. Henry II of England has invited his family to spend Christmas at Chinon where he has decided to announce that John is to be King after him instead of Richard. Of course, big brother is not about to let his little brother usurp him, and Eleanor is determined that her favorite son will be King as well. Geoffrey mean while plays both sides against each other, while trying to strike a deal with Philip II of France to make him King. Philip either wants the Vexin back or his sister married since it's been 17 years since she left France to come to England to be wed. Alais, meanwhile is tired of being a pawn, promised first to one brother and then another. She loves Henry, even though she's only his mistress. Instead of a happy family Christmas with caroling and wassail, the audience is treated to a war zone as the family fight and betray each other, picking at old wounds and creating new ones. And they get off on it! Peter O’Toole is the embodiment of Henry II (for a double feature watch Becket first where he plays the young king and then watch this film), the rough and gruff monarch who has held England tightly in the palm of his hand since the age of 21. He is evenly matched by Katherine Hepburn aging glamorous but formidable Queen. At the time, Hepburn was the same exact age that Eleanor was in the fillm. Watching the two of them go at each other is like watching a master class in acting. From her first entrance on the barge arriving at Chinon, she commands every scene she's in. She totally deserved the Academy Award for this film, although Peter O'Toole was again robbed of the Best Actor Oscar which went to John Wayne in True Grit. The film also won Academy Awards for John Barry's lush score and Best Adapted Screenplay for James Goldman. Everyone is incredibly well cast in this film from Antony Hopkins as the martially inclined Richard the Lionheart and his secret passion for men, John Castle as Geoffrey outspoken in his bitterness of being unjustly neglected, and Nigel Terry as the sullen youngest son who has the personality of a turnip. And then there is Timothy Dalton, as the young Philip II, only son of St. Louis, Eleanor's ex-husband, who proves that he is no man's boy. It's hard to believe watching this film that Hopkins and Dalton were making their film debuts. There are so many awesome and quotable lines in this film I don't know where to start. From Henry's line to Alais after they've made love and she's asked him what he would do if she stopped going along with the flow "It's going to be a jungle of a day, if I start growling now, I'll never last," to Alais's line about how John "has pimples and smells of compost." When Henry replies that he's only 16, he can't help the pimples, Alais replies "He could take a bath!" But the best lines in the whole film belong to Geoffrey who will just about betray anyone, if only to be noticed. "I know. You know I know. I know you know I know. We know Henry knows, and Henry knows we know it. We're a knowledgeable family." There are a few historical hiccups, There was no Christmas court at Chinon in 1183, Christmas trees weren’t brought to England from Germany until the marriage of George III to Princess Charlotte of Mecklenberg-Strelitz in the 18th Century, and there is no historical evidence that Richard the Lionheart was gay. But the film captures the complex dynamic and the tangled relationships of the Plantagenets. The film was remade in 2000 with Patrick Stewart and Glenn Close, but it doesn’t come close to the energy of the original film. Seriously if Showtime wants another series about dysfunctional royals, they would do well to option Sharon Kay Penman's trilogy about Eleanor and Henry and turn that into a four season series. I loved this film when it was new. And I'd love to see it again. I have never seen this movie - I really must do something about that! And I agree with you about Penman's trilogy - what a great series that would make! Happy Holidays. I can't believe I haven't seen this movie yet! I must sign onto amazon.com og play.com at once and order it! Daphene and Malena, you will enjoy this movie so much, particularly if you are a fan of the Plantagents. Funnily enough it was on TCM this past weekend.